The last resting place of the Nazi alsatian Giro. Description: Ambassador from 1932-6 was Dr Leopold von Hoesch, buried him here in what was formerly the front garden to number 9, now a small space between the Duke of York steps and the garage ramp - the tombstone, bearing the inscription Giro: ein treuer Begleiter! 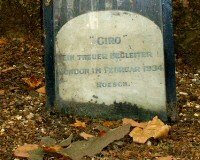 (Giro: a true companion!) can still be seen. Hoesch died in office in 1935 and, as a last remnant of the Weimar days, was accorded a full diplomatic funeral with a 19-gun salute in St James's Park. The distinctive doorknobs are certainly characteristic of German design of the time, and the marble on the current main staircase is said to have been a gift from Mussolini.